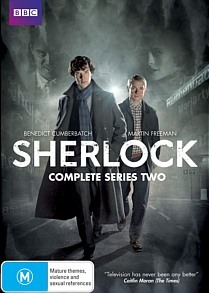 Sherlock Season 2 DVD Review. In short I did not like this season anywhere near as much as I liked the original season. Sherlock Season 2 or What I did on my summer holidays by Steven Moffat. The first season of Sherlock was, depending on your opinion. A fantastic re-invention of a classic British character that put the recent movie versions to shame or a travesty that brought shame and disgrace to a British institution. I lean towards the former, I think it was great, but had some issues. The first episode was good homage with a real twist at the end that demonstrated just how good a writer Steven Moffat can be. The second episode dragged for me, seemed fairly ordinary and lacked spark, but the third episode was great, introducing Moriaty with flair and flourish that belies that it was written by the usually terrible Mark Gatzis. The acting was great, the stories were great. Who wasn’t looking forward to season two? Once again there are just three episodes of Sherlock but each is two hours long making it as long as a regular 6 part series. The first episode is called a Scandal in Belgravia a nod or rehash of a Scandal in Bohemia depending where you sit. This introduces “The Woman” Irene Adler the only woman Sherlock ever has any respect for or dare we say feelings for? In the books or in this series. In the books Irene was an opera singer and courtesan but also someone of extraordinary skill in deduction. Here we see Irene as a Mistress who is unreadable to Sherlock but it seems mostly because she often does not wear clothes. Here the set-up is almost the same, there have been some compromising pictures taken by Irene of a high level official, Holmes is engaged to retrieve them. And…yeah….this didn’t engage me the same way that the episodes of the first season did. I think I was at first put off in the terrible way that they resolved the cliffhanger at the end of the first season. Then the entire episode seemed to want to titillate me. But I was not here for titillation I was here for intellectual stimulation, which did not arrive. The hounds of the Baskervilles likewise was ok but it was clear that in re-writing what has now become a classic story they lost the focus of it and made it somewhat of a mess. Homes and Watson are called down to Dartmore to investigate a murder on the moors, near a secret army base. Stuff ensues, Homes wins again. In short I did not like this season anywhere near as much as I liked the original season. Video: Video quality is very high, this is clearly a flagship series for the BBC and is shows in the care that is taken. Audio: Audio is a good 5.1 mix. Special Features: Only one documentary Sherlock Uncovered which focuses on how much of a success the first season was and how much pressure the production staff faced. Not terribly exciting.